Family of Thomas Kelly's one-punch killer defends him in Facebook post. 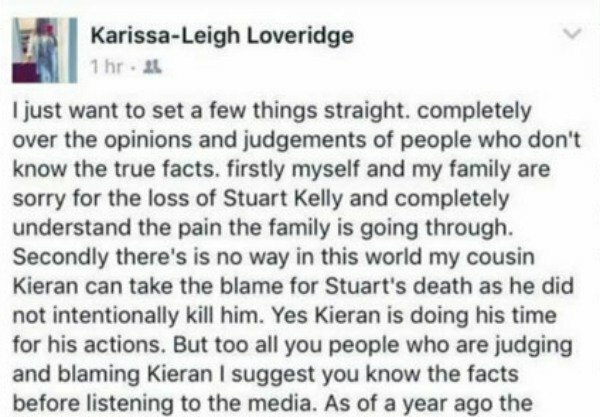 A relative of Thomas Kelly’s one-punch killer, Kieran Loveridge, has taken to Facebook to defend her cousin after the death of Thomas’s younger brother, Stuart. Karissa-Leigh Loveridge’s cousin Kieran is currently serving a 13-year prison sentence. Karissa-Leigh believes he isn’t in any way responsible for Stuart’s tragic death last week, Yahoo7 reports. 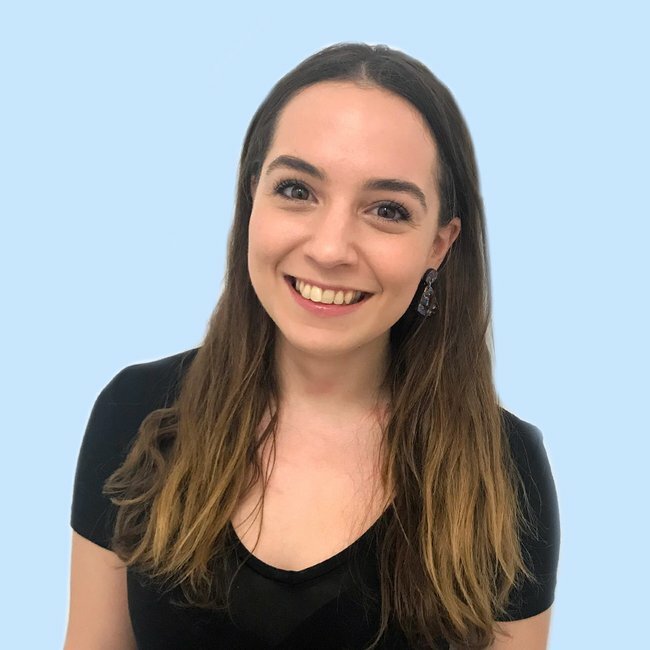 Instead, she blames Stuart’s parents for allowing him to be exposed to the relentless bullying that is believed to have contributed to him taking his own life. 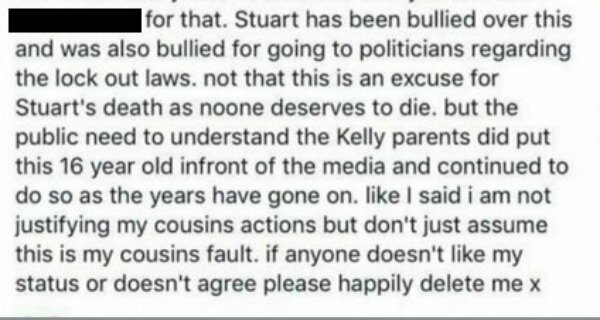 “There is no way in this world my cousin Kieran can take the blame for Stuart’s death as he did not intentionally kill him,” she wrote on Facebook before discussing the Kelly parents. She said Stuart, 18, was “bullied for going to politicians” over the lock-out laws, “not that this is an excuse for Stuart’s death as no one deserves to die”. “But the public need to understand the Kelly parents did put a 16-year-old in front of the media and have continued to do so as the years have gone on,” she continued. Her post has since been deleted from Facebook. Karissa&apos;s now-deleted post.Image via Facebook. Stuart’s death came four years after his older brother Thomas was killed in an unprovoked, drunken attack in Sydney’s Kings Cross. The incident sparked a controversial tightening of NSW’s lock-out laws to combat alcohol-fuelled violence. Stuart and his family created the Thomas Kelly Foundation and were staunch advocates of stricter legislation. Karissa-Leigh Loveridge. Image via Facebook. 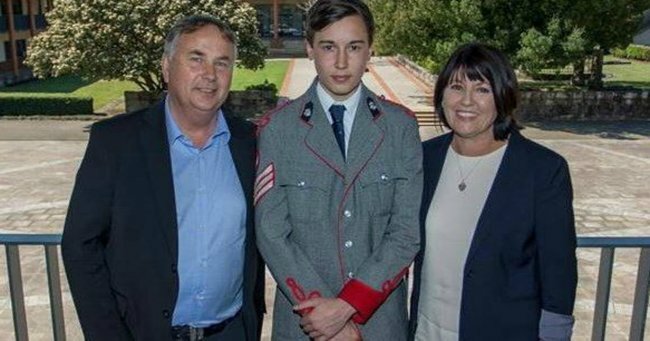 Karissa-Leigh said in her post while she was sorry for the loss of Stuart Kelly and "completely understand the pain the family is going through", she was fed up with "the opinions and judgments" Kieran was receiving. "I am not justifying my cousin&apos;s actions but don&apos;t just assume this is my cousin&apos;s fault," she wrote. Stuart&apos;s family last week penned crushing tributes to him after his death. His father Ralph wrote on Facebook: "The most painful goodbyes are the ones that are never said and never explained." “You are both so loved. My beautiful brothers, I’ll cherish (sic) our memories forever,” hissister Madeleine wrote. * Feature image via Facebook. Anyone who needs help is urged to call Lifeline at 13 11 14 or Beyond Blue on 1300 224 636.